FOXBOROUGH – Now, it finally feels like real Patriot football. The Minnesota Vikings were a better team than their 6-4-1 record suggested. They have a pressure defense and some blue-chip offensive weapons. 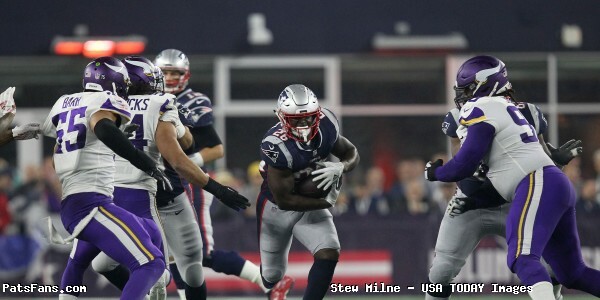 But the Patriots were able to take whatever Minnesota threw at them, and turned in a good effort in a 24-10 win over the Vikings on Sunday at Gillette Stadium. James Develin rushed for two touchdowns, Tom Brady threw a touchdown pass to Josh Gordon, and the Patriots improved to 9-3 and held on to the number two playoff seed in the AFC. The defense also enjoyed a good game, if you take away the last two minutes of the first half. Running back Dalvin Cook, and wideouts Adam Thielen and Stefon Diggs did not factor much into this game. Thielen did catch the only Viking touchdown of the afternoon thanks to blown coverages by both McCourty brothers just before halftime, but other than that, the leading receiver in the NFL was pretty much taken care of by the Patriot defense. The Patriots like to eliminate your top offensive weapon and let the other guys try and beat you, and it worked once again. Cook finished with 94 yards rushing on nine carries. Those numbers are a little misleading, in that three of those carries went for 68 yards. In the fourth quarter, Cook had only 4 yards on two carries. Cook also led the Vikings with eight receptions, but had only a total of 22 receiving yards. Three other receivers had five catches; Thielen had the fewest yards with 28. Kirk Cousins finished with 32 of 44 passing for only 201 yards, one touchdown and two interceptions. His rating was 70.4. Brady, on the other hand, was a magnificent 24 of 32 passing for 311 yards and a touchdown. His rating was 102.5. To the credit of the offensive line, Brady was never sacked in this game. James White was the receiving leader with seven catches for 92 yards. The Patriots have four games left. All of them are winnable, so we can now start with the annual “Assuming the Patriots run the table …” talk. The Patriots have to be careful, in that one or two are also loseable. The games remaining are road games at Miami and Pittsburgh, then two home dates with Buffalo and the Jets. Any game at Miami is potentially problematic (remember 2016? ), and one of these years, Pittsburgh is going to spank the Patriots at home for a change (even though they lost at home Sunday night to the Chargers). But let’s say that the Patriots do run the table. Then what? Another AFC top playoff seed? Let’s look first at Kansas City, the one team that currently controls its destiny to the top playoff seed. The Chiefs are 10-2, and won a chaotic 40-33 game at Oakland on Sunday. The Chief defense is as porous as the offense is talented. But the loss of running back/girl basher Kareem Hunt might change things for the Chiefs going forward. The otherwise respected organization took a hit with the Hunt situation this week, and it could perhaps affect their play down the stretch. Kansas City will entertain Baltimore at home, then a titanic matchup with the 9-3 Chargers at Arrowhead. This is followed by a road game at always tough Seattle and the 12th man, then they end at home with a gimme against Oakland. If the Patriots run the table, Kansas City has to lose one of these games as the Patriots own the tiebreaker with the Chiefs. Either the Charger game or the Seattle game are eminently losable for Kansas City. All the Patriots need to do is at least finish with the same record as Kansas City and they will be seeded ahead of them. Houston is on a very curious run down in the AFC South. They are now 9-3, same as the Patriots. Since the Patriots beat Houston in the season opener, they too hold the tiebreaker with the Texans. They finish with the Colts at home, road games at the Jets and Eagles, then finish at home with the Jaguars. The game at Philadelphia remains the biggest pothole for the Texans, but if the Patriots win out, Houston is not a problem. Pittsburgh is now 7-4-1. They still get New England at home in 2 weeks, but given how bad the Steeler defense still is, and how awfully Mike Tomlin seems to coach against the Patriots, the New Englanders can still go in there and win a shootout if they have to. The Patriots are very familiar with the Steelers and vice versa, but the Patriots have zero fear of Heinz Field. Even if the Steelers somehow find a way to top the Patriots, they still have a road game at New Orleans which will be problematic for them. They also have a road game at Oakland and a home date with Cincinnati, games which they will be favored in. Lurking out there is the one team that the Patriots might need to worry about: the Chargers. As previously stated, the Bolts are 9-3 and would be leading the AFC West were it not for the Chiefs. Right now, the Chargers are the top Wild Card team. But if the Chiefs were to falter and the Chargers run the table and finish 13-3 with the Patriots? The Chiefs and Chargers meet in two weeks at Arrowhead Stadium to decide that division. Otherwise the Bolts have Cincinnati and Baltimore at home, and they finish at Denver, where they are one of the few teams that don’t seem to mind the high altitude there. Running the table is not out of the question for the Chargers. Judging on Sunday night’s 33-30 win at Pittsburgh, the Chargers could very well go into Kansas City and win a shootout there, especially given that the Chief defense is about as bad as the Steelers’. So that puts New England and the Chargers at 13-3. Now what? If both teams win out, you would disregard the head-to-head as they don’t play each other this year, and you disregard division records since they are in different divisions. So, in conference records, running the table would put them both at 12-2. That means that breaking a tie between these two teams would involve, in order, common games, strength of victory and strength of schedule. It never gets past these three levels. The season would have to play out to see how these two teams fare in these comparisons, as too much of the season is left and too much can change, especially when bringing other teams into the mix for tiebreaking reasons. Plain and simple, you the Patriot fan should root for Kansas City to somehow win the AFC West and somehow suffer one more loss along the way. That, along with running the table, will give the Patriots still another top playoff seed and the cherished home field throughout the playoffs. It won’t guarantee a Super Bowl win. The other guys won last year, and the Rams and Saints look pretty tough right now. But this is basically what we are all looking at right now. Except Coach. We’re on to Miami. This entry was posted in 2018 Patriots Regular Season, Patriots Commentary on December 3, 2018 by Bob George.